HOOK CASE - The hook set comes with this perfect well-organized case. You can store all of your light up hooks in this compact case, no longer worry about losing any hooks again. Complete Set - Crochet Lite Hooks Sizes C Through K Which Are Color Coded.One Of Each Size: C (2.5mm), D (3.0mm), E (3.5mm), F (4.0mm), G (4.5mm), H (5.0mm), I (5.5mm), J (6.0mm) And K (6.5mm) . Each Crochet Hook Comes With G3-A Batteries Included. DESIGNED FOR MAXIMUM COMFORT - Our ergonomic crochet hooks designed with the highest & softest silicone handle. Our crochet hook case is tough and water-resistance. Everything is designed to let you focus on one thing, crocheting to your heart desire. Ergonomic Design Ultra-Comfortable Silicon Grips Are Easy On Your Hands For Long Crocheting Sessions And Give You Precise Control Allowing You To Create Super Detailed Designs. Great For Beginners, Intermediate Or More Experienced Crocheters. 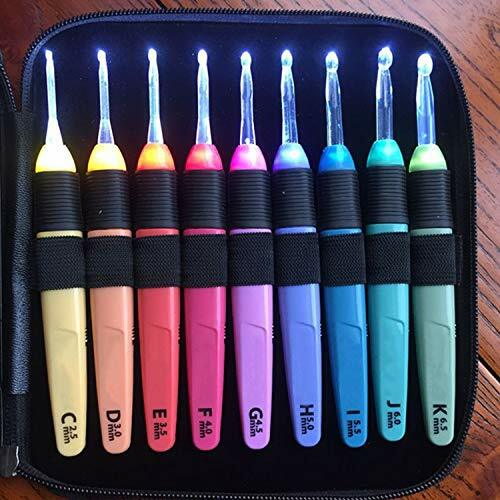 CROCHET ANYWHERE, ANYTIME - With these amazing Led Lighted Crochet Hooks, you can crochet effortlessly and see clearly with even the darkest yarn. You'll never have to stop or slow down again because of bad light or dark yarn. Hooks Storage Case - The Hook Set Comes With This Perfect Well Organized Case. You Can Store All Of Your Light Up Hooks In This Compact Case, No Longer Worry About Losing Any Hooks Again. If you have any questions about this product by THE SAFETY ZONEY, contact us by completing and submitting the form below. If you are looking for a specif part number, please include it with your message.